Climate Change and Infrastructure Resiliency Assessment - What Representative Concentration Pathways Should be Used to Estimate Future IDF Curves? Caution Using RCP8.5. 5) hydraulic roughness and energy losses in junctions, etc. 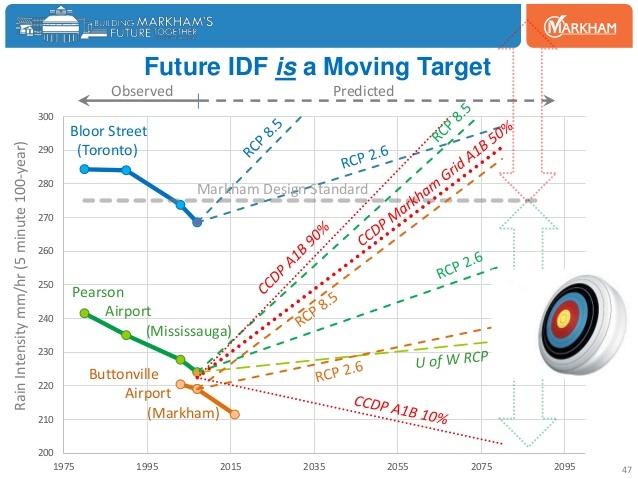 Considering future climate scenarios, the input IDF is also uncertain. Estimated future values often depend on the assumed Representative Concentration Pathway (RCP) which are called 2.6, 4.5, 6.0 and 8.5 and which represent progressively more extreme emissions, CO2 concentrations, and energy entering the troposphere (the number 2.6 represents the energy per area warming the planet you could say). Future design IDF estimation tools like the University of Western IDF_CC Tool give a choice of 3 pathways - 2.6, 4.5 and 8.5. The description of RCP 8.5 indicates that this scenario gives the most severe climate change impacts as noted below. But the extreme intensities do not always support that statement. The following future IDF intensity tables for RCP2.6, RCP4.5 and RCP8.5 show that the RCP4.5 scenario can give the highest short duration intensities that affect infrastructure capacity and resilience. The 5-year 5-minute intensity is highest for RCP8.5 but only 3.5% above RCP4.5, which is very small in the context of infrastructure design. But the 100-year 5-minute intensity for RCP8.5 is below the RCP4.5 values by over 8% - and the 24-hour intensity is also about 8% lower. So RCP8.5 is not the most conservative, 'most severe' scenario for extreme 100-year events. Note these tables are based on a period of 2050-2100. "This paper finds climate change scenarios anticipate a transition toward coal because of systematic errors in fossil production outlooks based on total geologic assessments like the LBE model. Such blind spots have distorted uncertainty ranges for long-run primary energy since the 1970s and continue to influence the levels of future climate change selected for the SSP-RCP scenario framework. Accounting for this bias indicates RCP8.5 and other ‘business-as-usual scenarios’ consistent with high CO2 forcing from vast future coal combustion are exceptionally unlikely. Therefore, SSP5-RCP8.5 should not be a priority for future scientific research or a benchmark for policy studies." Because there is such as wide range of future IDF possibilities already, it is good to know that RCP8.5 could be discounted as implausible in sensitivity analysis. The chart below shows various projections for 5-minute 100-year rainfall intensity for a range of RCP scenarios. Dropping RCP8.5 from further consideration will help focus assessments of infrastructure resiliency. But considering RCP4.5 may yield even higher IDF values than the assumed 'most severe' RCP8.5 scenario. RCP2.6 scenarios may not result in future IDF intensities that are above current design standard values as shown in the chart above. I have posted comments on three TVO Articles on the topic of climate change, extreme weather, urban flooding and resiliency of Ontario Cities. Readers of this blog will be familiar with the content. It gets a bit repetitive from article to article, only because the data gaps are the same old ones we always see on these topics. Windsor has the lowest level of service for floodplain protection (100 year storm) while other regions have Hurricane Hazel (over 500 year storm) - so Windsor / Essex region will flood a lot more that other places. Also Windsor has been effectively tightening up their sanitary sewers to prevent spills to the river (reduced combined sewer overflows (CSOs)) which means more stays in the sewers and can back-up basements in extreme weather. Its a tough trade-off when environmental protection (keeping sewage out of the river) means more sewage in basements. Basically, hydrologic stresses have increases (more runoff) and conveyance capacity has decreased (reduced CSO relief, tanks to protect beaches, blocked overland flow paths in old 'lost rivers'). Underpinned/excavated basements are now lower than before, closer to the crown of the sewer pipes in the street and more prone to sewage back-ups than before, with no change in rainfall extremes due to climate change. Robert J. Muir, M.A.Sc., P.Eng. There are many false statements in this article and a lack of basic science, statistics or critical engineering considerations. I am a licensed Professional Engineer with extensive experience in extreme weather statistics and municipal infrastructure planning and design (26 years) - this article is like 100's of others, skimming the surface and missing the critical data and conclusions, reinforcing stale pundit talking points in the climate-change-echo-chamber. Please see below for what is wrong with the article. Firstly, the article conflates climate and weather which have different temporal scales. Climate includes rainfall and precipitation over seasons, years and decades while weather related to flooding in urban areas involves rainfall over minutes and hours. So the cited increase in precipitation is irrelevant to urban flooding and insurance since precipitation trends over months and years do not govern the performance of infrastructure systems (storm sewers, sanitary sewers, drainage channels and overland flow paths) - that infrastructure is governed by extreme rainfall rates over minutes and hours. It is an undeniable engineering fact. And these short duration rainfall intensities are 'flat' across Canada according to Environment and Climate Change Canada, as published in Atmosphere-Ocean in 2014 - in fact ECCC stated that some regions have decreasing trends including the St Lawrence basin in Quebec and the Maritimes. Over the past two weeks I have correspondence from 3 scientists at ECCC stating that the annual precipitation statistic (climate) is irrelevant to urban flooding and the short duration rainfall (extreme weather) is what we should be looking at - across Canada the relevant data shows 'no detectable trend signal'. TVO should check the background of those providing information for these articles to see if the academic and practical experience aligned with the technical topic being discussed. It is too easy to just try and may headlines and exercise 'availability bias', 'anchoring bias' and other problem-solving short cuts with discussing extreme weather and flooding. It is more responsible to look at real data and fact-check articles because there is important public policy on climate adaptation and mitigation that relies on the proper characterization of the problems that we are solving. Blaming flooding on rainfall trends misdirects resources to mitigation when it should be focused on adaptation to yesterday's extremes (due to intrinsic design limitations in 50-100 year old infrastructure and land use planning). Chief economists at major banks have repeated IBC statements on extreme weather shifts with no fact checking whatsoever - the Sun, the Star, CBC and individual insurance companies have repeated it too without checking. They have been fact checking with ECCC recently though and the consensus is that there is no shift in extreme rainfall and IBC mixed up a theoretical future shift (of an arbitrary 'bell curve' no less) and had reported it extensively as a past observation by ECCC. ECCC has denied that their data shows any increase in severe weather with climate change. And which had this correction made based on ECCC and real data: "However, Environment Canada says it has recently looked at the trends in heavy rainfall events and there were "no significant changes" in the Windsor region between 1953 and 2012." "Only the small secrets need to be protected. The big ones are kept secret by public incredulity. "(attributed to Marshall McLuhan) .. .so true, especially when we rely on infographics and slogans and ignore basic data in our reporting. Citing IPCC is irrelevant in the context of urban flooding in Ontario cities .. IPCC's definition of 'heavy rainfall' is the 95% percentile of daily rain with in Toronto is about 29 mm of rain - that is big for 'climate' but tiny for 'weather'. Typically storms have to be 3 times that big to cause urban flooding and most new communities are designed to handle 100-year design storms with built-in resiliency measures / safety factors to handle larger storms (if we see a hockey stick and get more extreme rain in the future). These change in hydrology and runoff potential are undeniable and dwarf any noise in the extreme rainfall statistics. The 'new normal' is in fact the 'old extremes' that we have always had .. the system response is more severe however with greater runoff into the same 50-100 year old infrastructure and confined channels along the lower portions of our watersheds. When it comes to urban flooding, only Milli Vanilli 'Blame it on the Rain'. Nobody cares about hydrology. Canada's greatest hydrologist Vit Klemes once lamented about this saying If you have not read it, please see his key note address to International Interdisciplinary Conference on Predictions for Hydrology, Ecology, and Water Resources Management: Using Data and Models to Benefit Society, entitled "Political Pressures in Water Resources Management. Do they influence predictions?" genie back in the bottle and the government is playing along pretending to help solve problems while ignoring true causes. "[the theorists] find it easier to play trivial scenario-generating computer games while the [managers] find these games much easier to finance... And so by happy collusion of interests, an impression is created that 'something is being done for the future' while the real problems are quietly allowed to grow through neglect of the present"
That is 100% correct. We are ignoring the present risks of today related to hydrology and blaming our flood problems on a climate change computer game (Weather Zoltar if you will). RIP Dr Klemes .. I still remember your guest lecture in our undergraduate class and wish you were around to speak truth to power on this topic. Radical Transparency. Uncovering the 'big secrets' in urban flood risk adaptation and extreme rainfall trends under climate change in Southern Ontario. "Truth and untruth exist at the same level of authority on the internet." "Only the small secrets need to be protected. The big ones are kept secret by public incredulity." Too bad. Lets expose the big secrets in flood risk management and climate adaptation, and give truth the upper hand, shall we? Lets encourage "radical transparently". Why? So that we can create data-driven, evidence-based policies to cost-effectively manage flood damages and reduce risks to people and property. This radical transparency is promoted by Ray Dalio, founder of Bridgewater Associates (see his Ted Talk here on successful investing and company building). Dalio says that to be successful we need to "bet against the consensus" and "be right". The presentation below on the key drivers for managing flood risk in Southern Ontario goes against the consensus in terms of extreme weather extremes (showing they are down not up) - but its not a bet, but rather a careful review of data - so in that regard I trust it is 'right' .... or certainly right-enough for its intended purpose given all the other uncertainties in hydrology and hydraulic disciplines. Ray Dalio in his Ted Talk shares his painful "Fail Forward" moment of ruin and how he used the experience to improve his decision making. He said "Rather than thinking 'I'm Right', I started asking myself 'How do I know I'm Right?' I gained a humility I needed in order to balance with my audacity. I wanted to find the smartest people who would disagree with me to try to understand their persepctive or to have them stress test my perspective. I wanted to create an idea meritocracy ..."
Let me know your thoughts. I welcome any 'stress test' of my OWWA WEAO Joint Climate Change Committee presentation above. Thank you so much! Less Extreme Short Duration Rainfall in Kitchener-Waterloo - IDF trends do not show climate change impacts that would affect urban flooding. Update of Intensity-Duration-Frequency (IDF) Curves for the City of Waterloo and the City of Kitchener Prepared By: Donald H. Burn, Ph.D., P.Eng. Department of Civil and Environmental Engineering University of Waterloo, August 2012. "Annual maximum rainfall data for durations ranging from five minutes to 24 hours were analyzed for trends using the Mann-Kendall non-parametric trend test. Although no statistically significant trends were identified, there were noticeable patterns in the magnitude and direction of the trends in the rainfall data, as a function of the rainfall duration. Based on the available rainfall data for the period 1971 to 2007, new intensity-duration-frequency (IDF) curves were developed for the Waterloo Wellington A climate station; the curves can be used as IDF curves for the City of Waterloo and the City of Kitchener. The Pearson Type III (PE3) distribution was identified as the preferred distribution function for the data and formed the basis for estimating the quantiles required to form the IDF curves. The rainfall intensity values for the new IDF curves tend to be lower than the corresponding values for the existing curves for rainfall durations of up to one to two hours and generally slightly higher than the rainfall intensity values for the existing curves for the longer rainfall durations. The results indicate that the existing IDF curves for the City of Waterloo and the City of Kitchener are likely somewhat conservative for rainfall durations less than two hours, although the impacts of climate change could result in more severe events in the future." Trends in Canadian Short‐Duration Extreme Rainfall: Including an Intensity–Duration–Frequency Perspective Mark W. Shephard, Eva Mekis, Robert J. Morris, Yang Feng, Xuebin Zhang, Karen Kilcup & show all Pages 398-417, Published online: 19 Nov 2014 (Atmosphere-Ocean). IDF update to assess climate change impacts for sewer design shows decreasing 5-year rainfall intensities for durations less than 120 minutes (2 hours) - small flashy urban drainage systems now have lower extreme rainfall risk than with previously higher rainfall. Therefore earlier designs using older, higher rainfall design intensities have a safety factors against extreme weather risks for frequent events, and climate change has not adversely affected Kitchener-Waterloo erosion risks or erosion damage potential (erosion risks are often governed by frequent storm stresses). IDF update to assess climate change impacts for sewer design shows decreasing 25-year rainfall intensities for durations less than 90 minutes (one and a half hours) - small flashy urban drainage systems subject to nuisance flooding now have lower extreme rainfall risks. Therefore earlier storm drainage designs using older, higher rainfall design intensities, have a safety factors against extreme weather risks, and climate change has not adversely affected Kitchener-Waterloo flood risks or damage potential. Wastewater systems that have extraneous flow stresses (i.e., inflow and infiltration) and that respond to short duration rainfall appear to have lower capacity stresses with climate change IDF update. A Class Environmental Assessment Master Plan study in Kitchener has shown that peak wastewater flows in the trunk systems (e.g., Ottawa, Manchester, Montgomery trunks) are most highly correlated to short duration rainfall intensities. A Class Environmental Assessment study of the Sandrock Greenway trunk has also shown that smaller local wastewater systems respond to short duration rainfall intensities, even without high inflow potential in catchments with fully and partially-separated foundation service catchments). IDF update to assess climate change impacts for sewer design shows decreasing 100-year rainfall intensities for durations less than 90 minutes (one and a half hours) - small flashy urban drainage systems now have lower extreme rainfall risk today compared to previously higher intensities. Therefore earlier designs using older, higher rainfall design intensities have a safety factors against extreme weather risks for rare storm events, and climate change has not adversely affected flood risks or flood damage potential. Why do derived IDF values decrease? Because the observed maximum rainfall amounts in the Annual Maximum Series (AMS) have been decreasing. The following two graphs show trends in annual maximum rainfall recordings from 1971 to 2007. The 5-minute duration maximum rainfall has been decreasing and the 2-hour maximum rainfall have been flat - it is over this range that IDF intensities have been shown to be decreasing n the earlier graphs. Prime Minister Justin Trudeau recently stated "We are a government grounded in science". If so, why has he stated that 100 year storms may occur every 10 years or sooner following 2017 flooding in Gatineau? There is no data to support the storm frequency statement made by the Prime Minister.